Over the next three years, the UK Government Department for Business, Energy and Industrial Strategy (BEIS) are investing £320m of capital funding into heat networks via the Heat Networks Investment Project (HNIP). Heat networks have the potential to substantially contribute to the UK’s ambition to decarbonise heat, however only if the source of heat for the network is low carbon. 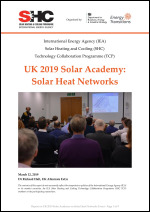 One of the most effective ways of decarbonising a heat network is to use solar heat and we invited to the UK two National Experts from the IEA SHC Task 55 (Towards the Integration of Large SHC Systems into District Heating and Cooling (DHC) Networks) to speak on Solar Heat Networks. They were Jan Erik Nielsen from the renewable energy planning specialist PlanEnergi (Denmark) and Christian Holter from the solar engineering company SOLID (Austria). We also invited three UK experts to speak: Grant Feasey from the solar collector manufacturing company AES Solar; Renaldi Renaldi from Newcastle University; and Edmund Papworth from the small-scale heat network company, Minus 7. By the opportunity of Task 55 expert meeting held in China, Chinese country member of SHC applies for an onsite training course and approved by SHC Solar Academy. 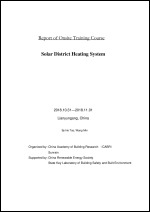 In Oct.31th to Nov. 1st, onsite training course Solar District Heating System was finished successfully in Lianyungang under the organization of China Academy of Building Research (CABR) and Jiangsu Sunrain Solar Energy Co.,Ltd. 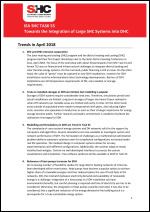 The programs of Solar Heating and cooling (SHC) as well as District Heating and Cooling (DHC) belong to the 5 main technology collaboration programmes (TCP) of the IEA (International Energy Agency). SHC was among the first programmes of the IEA established in 1977. Its goal is to promote the use of all aspects of solar thermal energy. 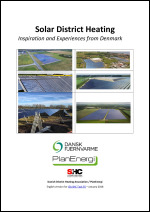 This document brings together some of the most important experiences from the inspiring development of solar district heating systems that have been seen in Denmark in the past years. The document is an adapted translations of “Solvarme – Inspirationskatalog” from February 2017, elaborated by PlanEnergi for the Danish District Heating Association. Some of the conditions and regulations described might be specific Danish. The main objective of this document is to inspire and qualify the district heating companies (board members as well as operating personnel) as well as representatives from municipalities with respect to the specific processes in the project development phases. This is not a proper guidance in the establishment of solar installations. 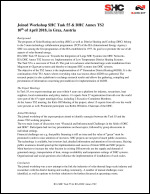 More specific guidance can be found in IEA SHC Task 45 and Task 55 guidelines and fact sheets and in the Europeran SDH projects – see last section in the document. This document thus complements these guidelines with specific Danish experience. After summing up to the various protagonists follow descriptions of six specific Danish solar district heating plants – and some experiences gained here.